Classrooms are private places. A lucky few - consultants and inspectors amongst them - get to visit hundreds of classrooms a year, yet many teachers never get the opportunity to see how other teachers 'do it'. 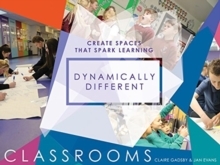 In Dynamically Different Classrooms Claire Gadsby and Jan Evans take away the guesswork by providing a visually striking masterclass on how to design and use the space within classrooms to enhance pupils' learning experiences. Packed with a variety of practical ideas, this inspiring book takes teachers on a unique journey of classroom discovery - from 'sacred spaces' to 'pit stops', and from 'enable tables' to 'independence stations' - and gives them an instant shot of creativity as well as a thought-provoking point of comparison with other schools and phases of education. Teachers will be inspired, intrigued and compelled to take action - literally moving the furniture and clearing the walls in order to 'spring clean' their practice. Suitable for all teachers, senior leaders, trainees and teaching assistants in all phases of education.